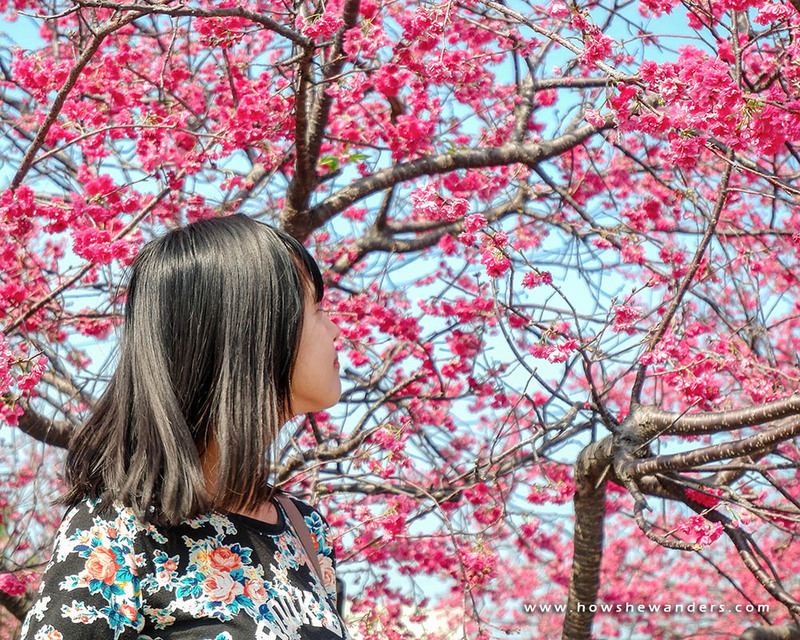 Witnessing cherry blossoms was an old-age dream that came true just recently. To catch sight of this once a year wonder, people often apply for visa and flock to Japan or Korea which are among the usual go-to places for sakura viewing. 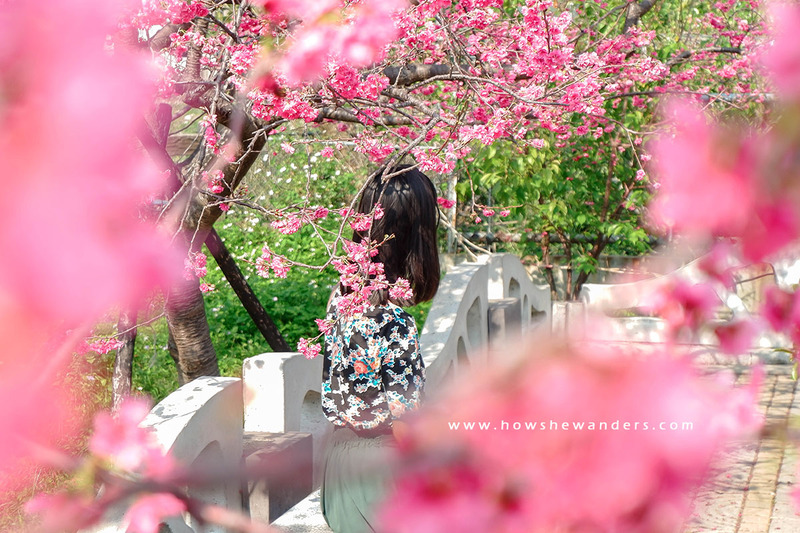 Not many people do know that there’s this small-but-INCREDIBLE country that’s a sakura haven too: Taiwan! And fortunately enough, Taiwan extended visa-free privilege for Filipinos until July 31, 2019. Ever since I’ve heard about it, just the thought of witnessing cherry blossoms and experiencing a different season besides summer and rainy brings so much excitement and kilig! Cherry blossoms at Tai’an, Taichung. At the end of this sidewalk is where the Tai’an Police Station stands. 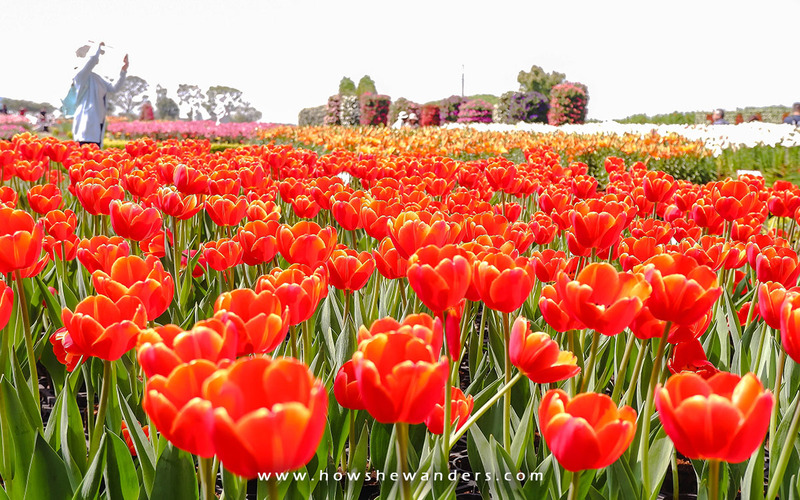 Not only that we’ve got to see sakura trees in full bloom, but seas of tulips as well! It was like Japan and Holland rolled into one! Cherry blossoms have different types according to number of petals and shades of color. 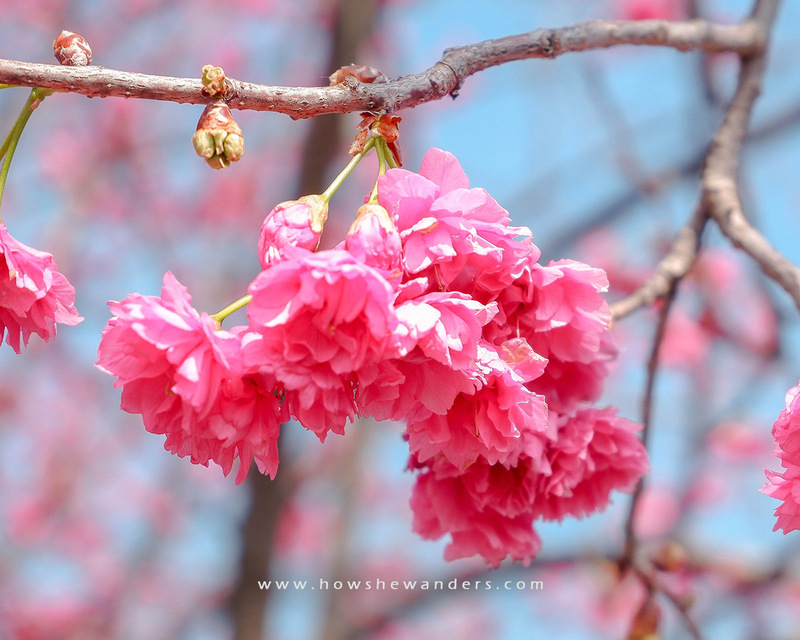 The ones we’ve seen in Tai’an, Taichung are “Yaezakura”, a type of cherry blossoms having more than 5 petals. 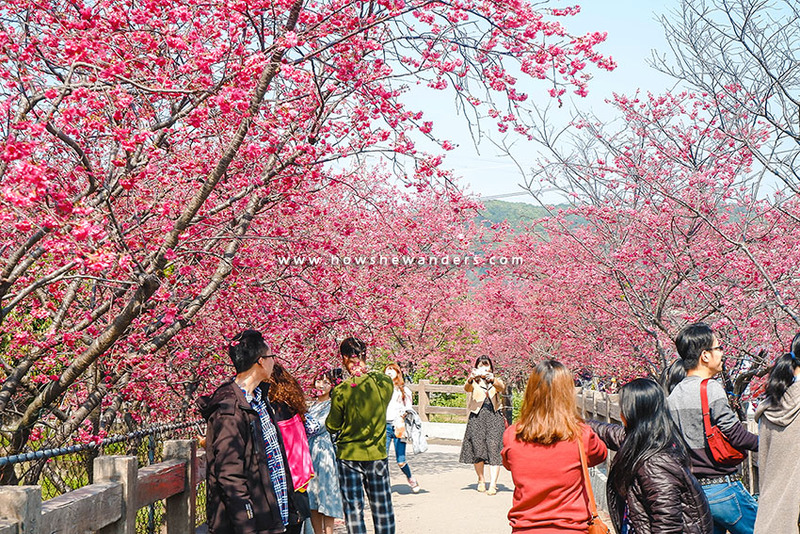 Most varieties produce white to light pink blossoms, but there are also cherry trees with dark pink such as the ones in Taichung. We started our day having buffet breakfast at King Plaza Hotel at 7am (breakfast serving is until 9am only). Meals were delicious but they have no rice! And forgive me as I really don’t know how to call most of the food as they were new to my taste buds (but I liked them!). We also had whole wheat bread with chocolate spread and coffee (the only ones I’m familiar with). Funny how our tummies got full even without rice! From our hotel, we walked to Taipei Main Station where we could catch the THSR train going to Taichung. Walking took about 10 minutes, a good warm-up for those who love to walk (which also translates to “walang pantaxi” 😜). The cool and pleasant weather combined with unpolluted air made our walk more comfortable. Our THSR schedule was 8:11am. We presented our THSR tickets together with our passports to the staff. 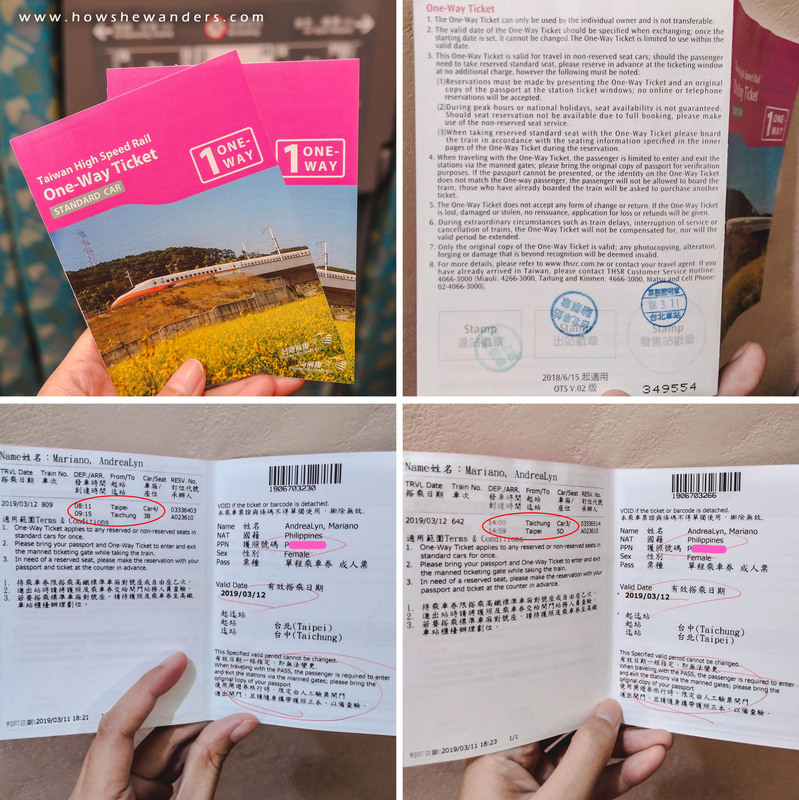 The personal details in the tickets and passports should match. Note: We claimed our tickets and reserved our seats the day before using our Klook vouchers that we bought online beforehand. The train left at around 8:20am and arrived at Taichung Station at 9:15am (we still arrived on time!). The ride was fast and smooth. To be exact, the train was moving at 824 kph! Bus ride usually takes about 4-5 hours depending on traffic, that would be 8-10 hours travel time in total! Well, thanks to THSR for allowing us to save time and making it possible to day-tour Taichung! 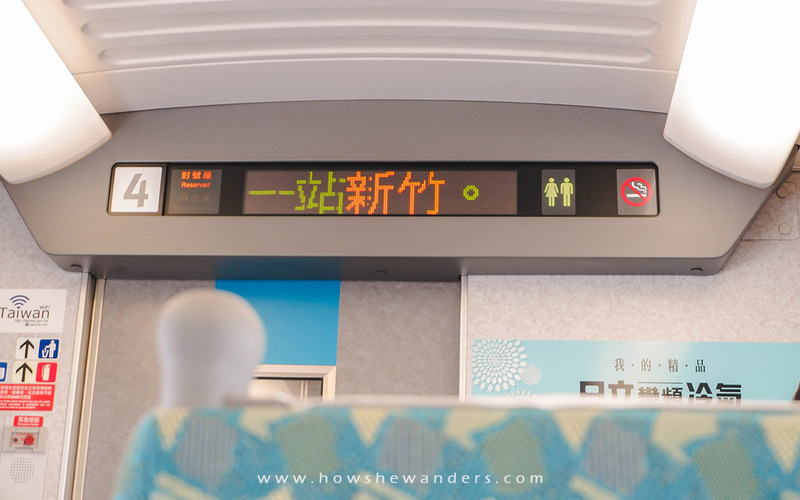 LED display that shows the next station, temperature, and train speed. Aside from the fast and smooth travel, it was also a comfortable and convenient ride! The seats are spacious enough and comfy. Just like in airplanes, each seat has foldable tray-table and bottle holder. There’s also comfort room on board! It was more like boarding an airplane than riding a train. Upon alighting at Taichung Station, we transferred to the local train (TRA) which only involves a 5-min walk. Taichung THSR Station is just connected to Xinwuri TRA Station where we could board a train going to Tai’an Station. We were unsure about what platform to board so we asked a staff who readily assisted us despite the language barrier. We just told him we’re going to Tai’an Station. Then he showed us a monitor and pointed to a specific station to make sure that’s the station we’re pertaining to. He told us to board at Platform 2 then. Until now I couldn’t forget his face and how joyful and friendly he looked and all the hand signs and gestures he did while assisting us. He’s an old man by the way, old people are my weakness. They bring joy to me as much as toddlers do (I suddenly missed my lolo). The train arrived after roughly 5 minutes. The local train is equally comfortable, only difference is that there are more seats and not as fast as THSR (but still fast!). Travel time from Xinwuri Station to Tai’an Station was about 45 minutes. Around 40 NTD was deducted to our EasyCard load upon exiting Tai’an Station. 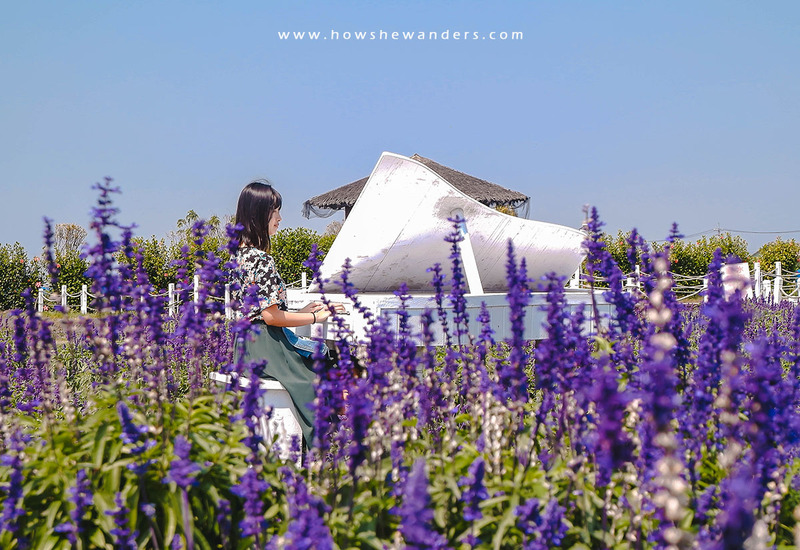 From Tai’an Station, we have an option to take a taxi or walk to Zhongshe Flower Market. Of course, we opted to walk because we love to walk, right?! Besides, the weather was too pleasant and the wind was too cool for a boring taxi ride. It was an enjoyable 15-min walk for us! 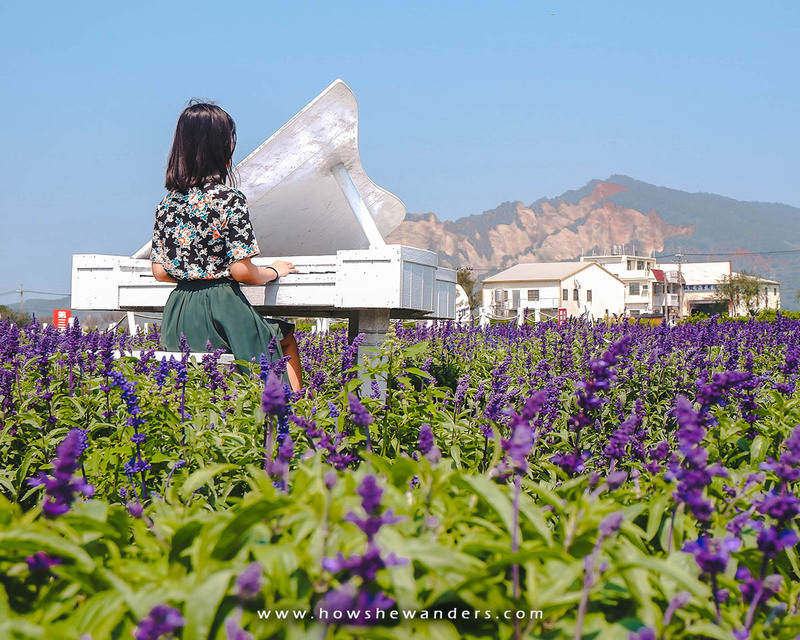 It is also commonly known as Houli Flower Farm or Chungshe Flower Farm. But I’m gonna use Zhongshe Flower Market instead for easier tracking since that’s the name registered in Google maps. 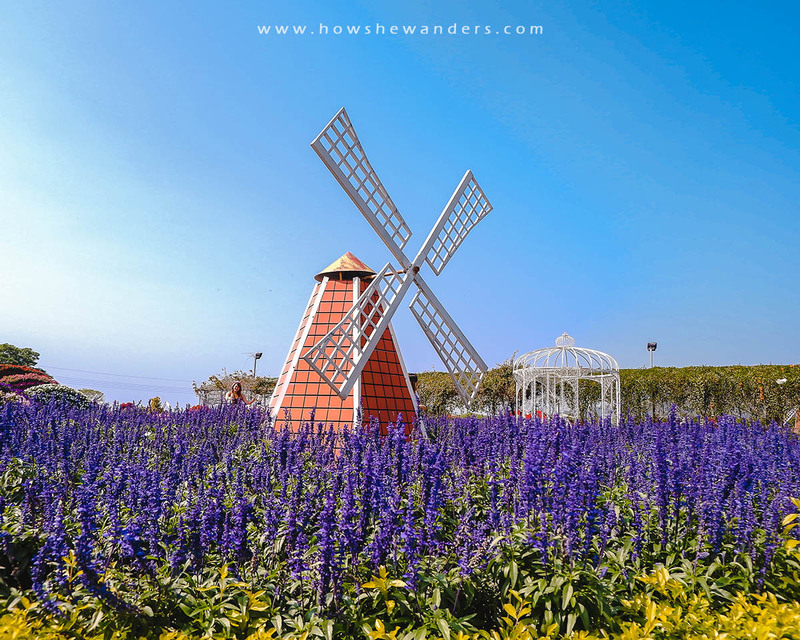 Zhongshe Flower Market is a vast 6-hectare flower farm which is one of the most popular tourist spots in Taichung. Seas after seas of flowers will amaze visitors all year round. 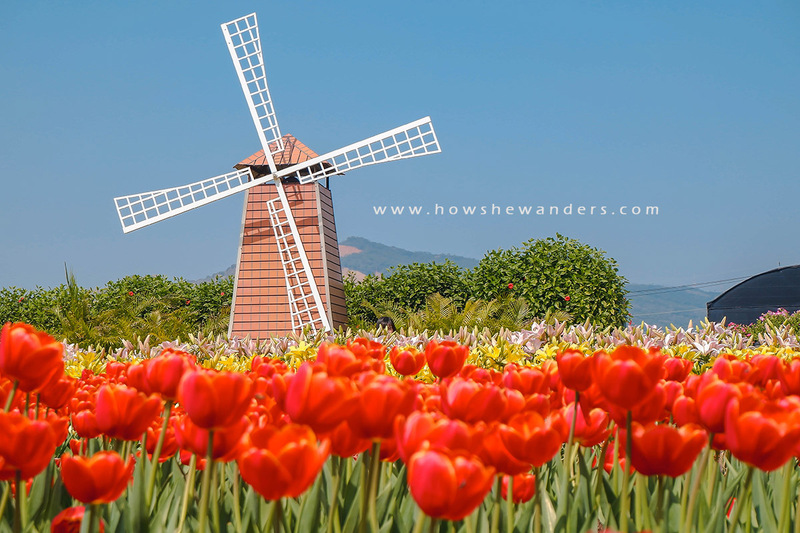 But best time to visit is during tulip season which begins from January until March. Admission Fee is 150 NTD. The place is definitely a picture-taking haven. I actually discovered this place through Instagram. There was even a pre-nup photoshoot being conducted during our visit. The vastness of the place makes it easier for people to find their own photo-ops spot. There were many people during our visit despite the fact it was a working Tuesday. Maybe because it was tulip (peak) season. Now, let our photos further describe the place. After a couple of hours of tiresome picture taking, it was time for lunch! There’s a barbecue house at Zhongshe which I heard good comments from other blogs. As much as we wanted to try but it was eat-all-you-can style. We like eat-all-you-can’s and barbecues but not “eat-all-you-can-bbq”. It’s not really a great combination for us. 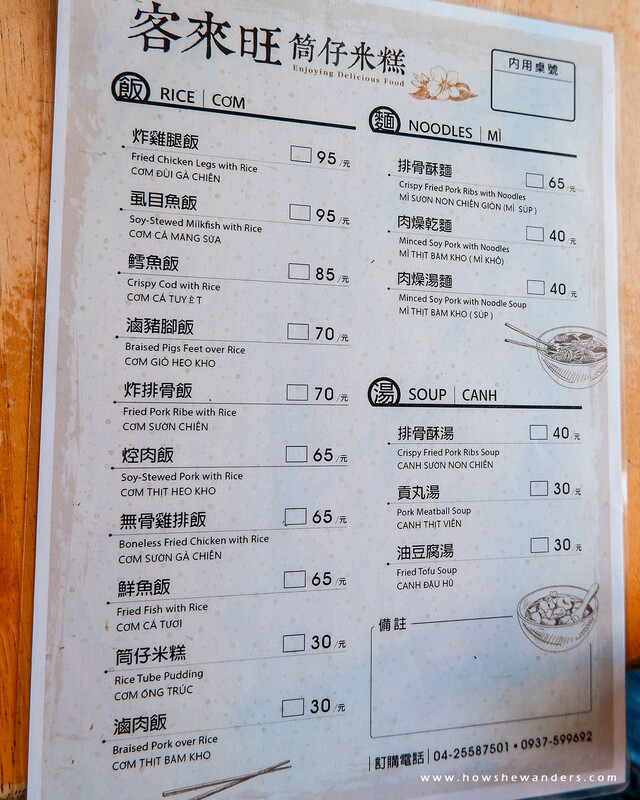 Not to mention it would cost us 350 NTD (≈620 PHP) per person, a total of 700 NTD. So we tried to look for other restaurant outside Zhongshe. Just at the opposite side of the road fronting Zhongshe, there’s a local restaurant that we thought was worth the try. It has no english name so let me just show you a photo. 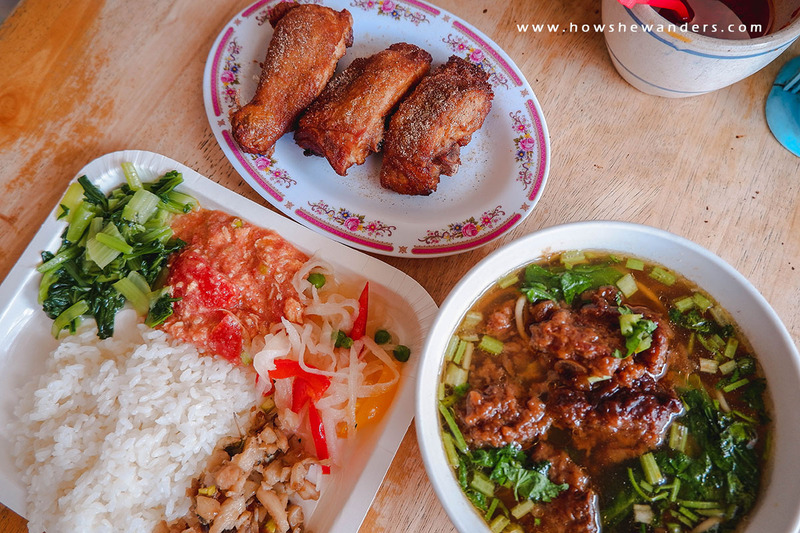 We ordered Crispy Fried Pork Ribs with Noodles and Fried Chicken Legs with Rice. Yes, with RICE! When the orders came I thought there was a serving mistake because I did not expect the many side dishes. Then we assumed they do not serve rice alone. Rice should always come with vegetable side dishes. And they don’t eat meat only or veggies only, they try to balance everything. That Fried Chicken Legs with Rice sounds “ordinary”, right? But I tell you, do not be deceived by the name! It’s not just an ordinary fried chicken. This is probably the tastiest chicken I’ve ever tasted! I could even trade my Chickenjoy for it (kidding aside). I’m just saying it really isn’t ordinary. The craziest part, we only spent a total of 175 NTD. Yes, that’s for the two of us already! So if you’re on a tight budget, this would be a great option. Our THSR schedule going back to Taipei is 2pm, and it was already past 1pm so we thought it will be better to explore more since we’re late anyway. 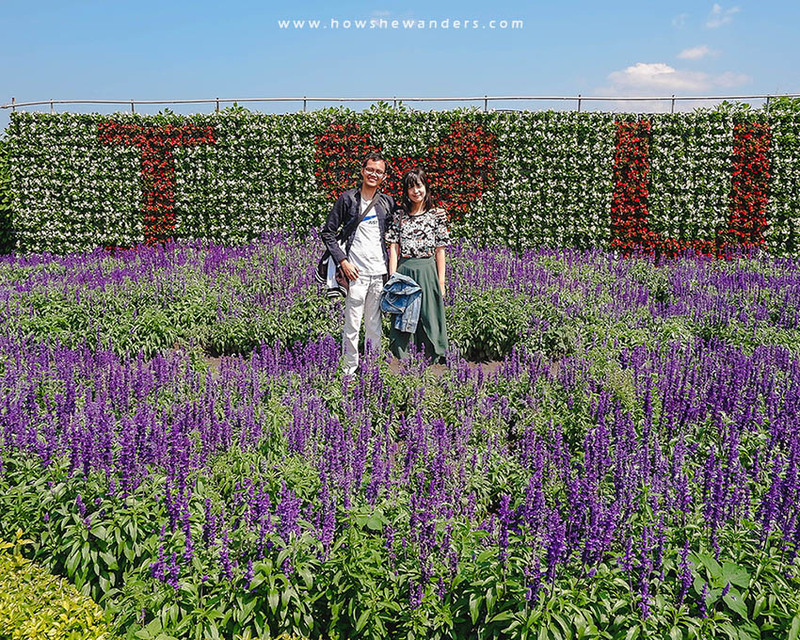 We went back to Zhongshe Flower Market after having our lunch to spend few more minutes appreciating the views. We took a taxi for our next destination. We told the driver to take us to Tai’an Police Station but he took us to Tai’an TRA Station instead (good thing it’s just along the way). 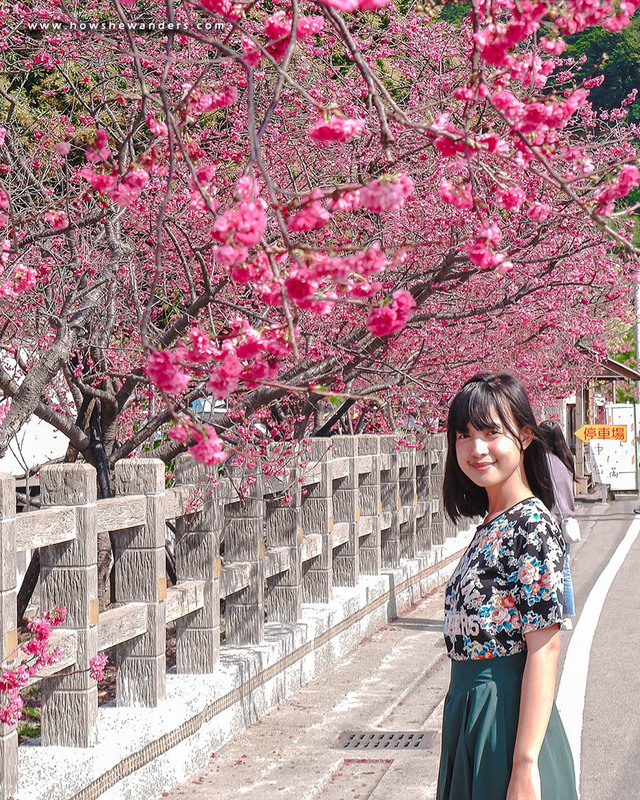 He didn’t seem to understand so I told him, “the place with many cherry blossoms” and he said, “Ahh.. Tai’an Sakura”. He charged us 200 NTD for the 5-minute ride (2.7km). Yes, that’s quite overpriced. Lesson learned for the nth time: Always make sure the taxi has meter. It was hard to bargain due to language barrier so we just let it pass. We were greeted by rows after rows of sakura trees in full bloom. I never thought cherry blossoms would be that super duper pink! I’m pretty sure pink fanatics would go crazyyy! The cherry blossoms that exist here are in “Yaezakura” type. This is a type having more than 5 petals and are at the pinkest! 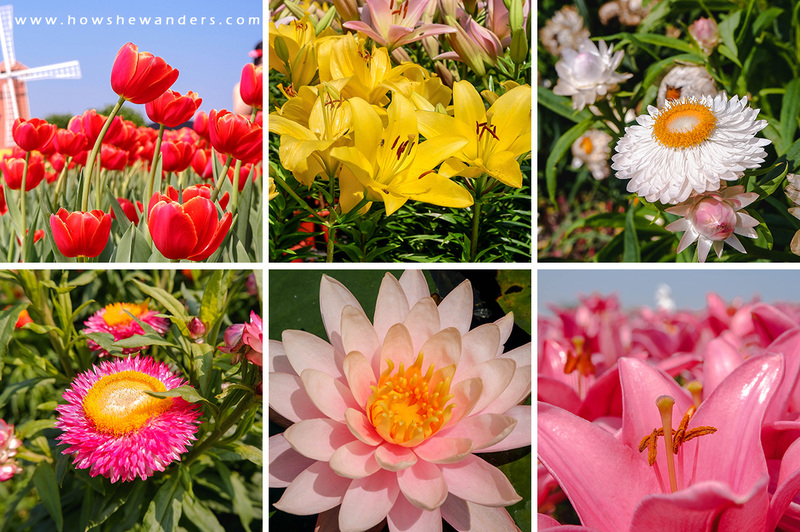 According to my research (wow), there are also Yaezakuras with white to light pink blossoms and there are some with colors that vary according to their blooming stage. As a matter of fact, I’ve done minimal editing in our photos. The colors are almost untouched! Rest assured that your expectations would match the reality. The whole sakura-filled area is quite expansive. We didn’t have a hard time finding our own photo-ops spot despite the place being packed with people. It was such a dream come true for me. 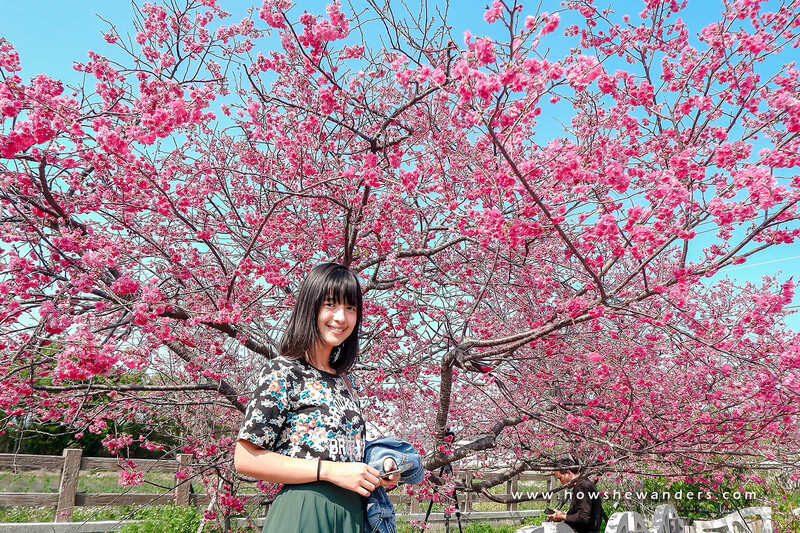 Imagine yourself being surrounded by cherry blossoms at their pinkest bloom. I was mesmerized and in deep awe of this awe-mazing work of art by the awe-mazing Grand Artist: God. Just like His many other masterpieces, He painted these pink wonders for us to enjoy! Tai’an Police Station stands at the end of this sidewalk. The weather looks super warm in photos, but in reality it was cool enough that we were able to explore without having to hide under a shade. Temperature felt like 18°C. We took a taxi again going to Tai’an TRA Station as our feet were complaining already. We waited for about 30 minutes before the train arrived. We reached Xinwuri Station at around 4:30pm. 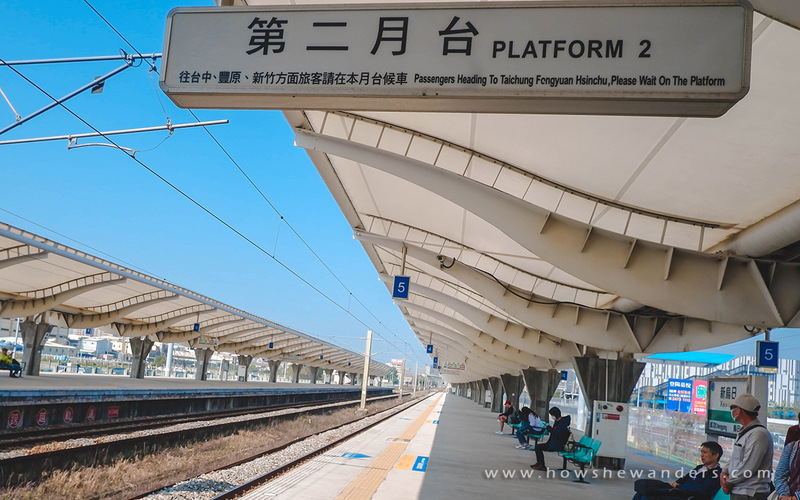 From Xinwuri Station, we transferred to Taichung THSR Station where we boarded a train going to Taipei Main Station. This time, we took the non-reserved seats since we missed our 2pm schedule. The seats are just the same as the reserved ones, only that it’s at first-come-first-serve basis. It was still a hassle-free and comfortable ride since the train wasn’t full. We reached Taipei Main Station at around 6pm. We had our dinner at Ningxia Night Market (just few blocks away from our hotel) which I will talk about on my next post. How about you? 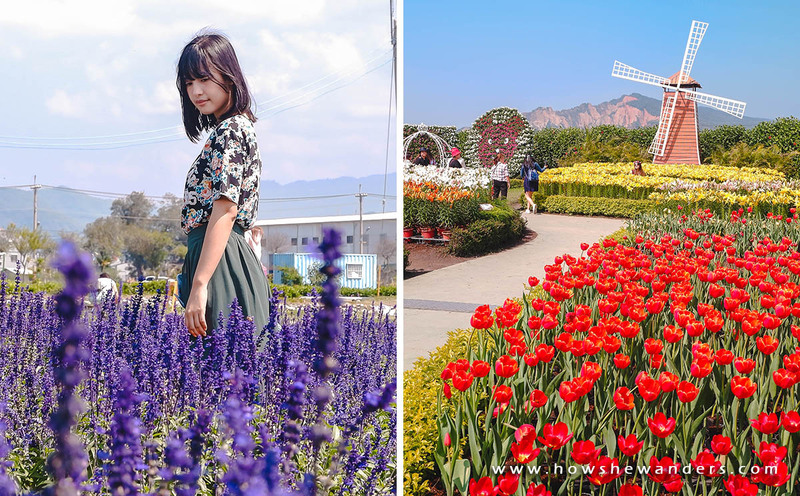 Have you experienced Taiwan’s spring season too? 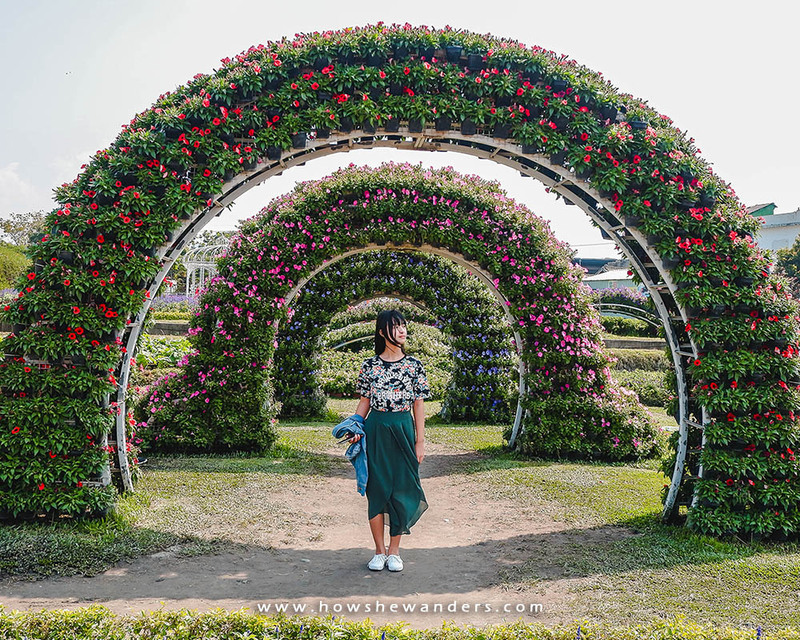 Or do you know other places in Taiwan worth visiting during spring? Feel free to share below! 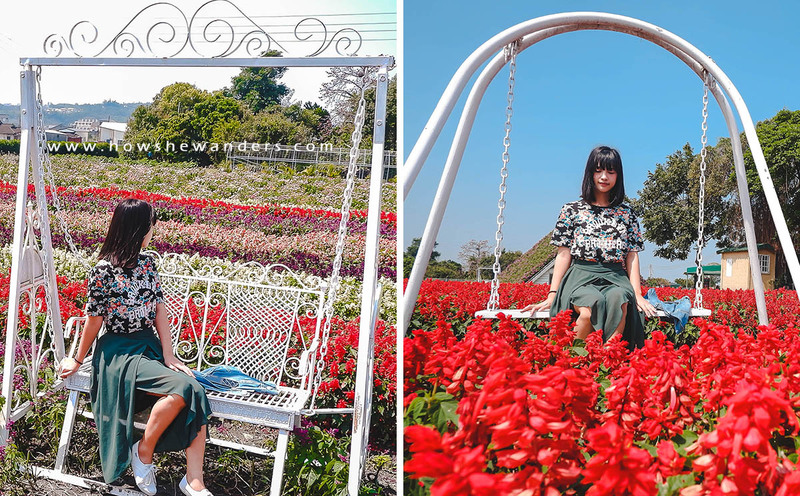 Beautiful shots, especially the flower photos!